College of the Desert in Palm Desert is one of the 112 institutions in the community college system of California. With an enrollment of 13,000 students, as many as 20,000 to 30,000 documents are processed annually at the college. Using a paper-based application and filing system, the college was servicing a high volume of commuter students with inconvenient and inconsistent enrollment processes. “With paper forms, students had to travel up to three hours to submit documents or complete their student files,” says Dr. Annebelle Nery, Executive Dean, Enrollment Services. “Student lines at the counter were very long. Once students got to the front of the line, they were extremely frustrated because we’d either lost their documents or the documents were stuck in processing—but where exactly, we weren’t sure. Information requests were funneled through as many as five departments in order to compile a complete and accurate student file. Records systems were siloed from the college’s student information system (SIS), and staff members had to search multiple locations to find a complete student file. 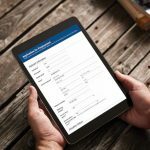 To improve operational efficiency, the college replaced 20 different paper forms with Laserfiche electronic forms that are instantly accessible through a student’s online portal. Routes it to required employees and departments for processing. 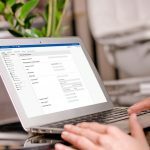 Emails status updates to the student throughout the review process. Attaches documents to the corresponding student file in the SIS. Associating metadata fields with electronic forms track the exact status of each application at every step of records processing. All departments now access and use a centrally managed document management system, reducing overall costs for maintenance and IT support. Staff members aren’t just sharing information more efficiently with students—they’re collaborating across departments to reduce excessive paper volume and needless filing efforts. 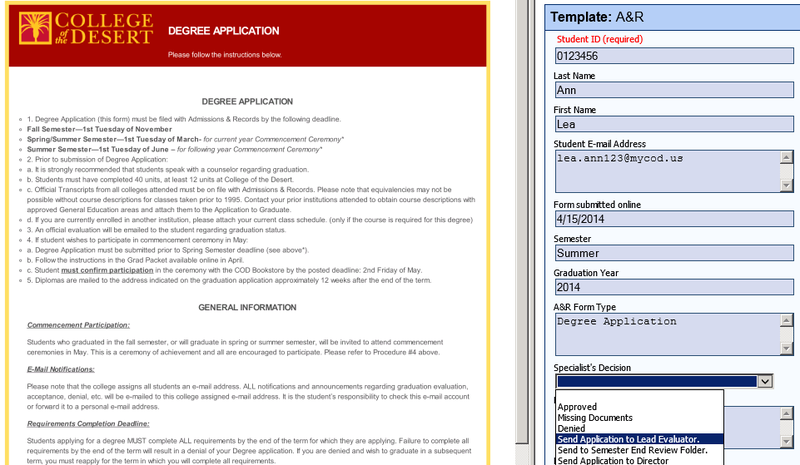 See additional screenshots of the college’s campus-wide e-forms and approval workflow configurations. With Laserfiche, the admissions and records and financial services departments now require 40% less time to process applications and petitions. Inquiries from students and lines at the service counters have decreased significantly now that students receive email notifications about their applications. “The frustrated phone calls from students are down and now we’re getting calls from other departments that want to use Laserfiche,” says Dr. Nery. The college met accreditation standards by being able to offer its main campus services to extension centers and online students. Student satisfaction levels have risen sharply and even the Board of Trustees has complimented the college on its Laserfiche initiative. Recently, the college received the Models of Efficiency Award from University Business Magazine, which recognizes institutions with business savvy and technological expertise. Looking to digitize student records and paperwork processing at your institution? Schedule your free demo of Laserfiche Forms for colleges and universities.